With an almost unlimited scope for customisation, Direct-To-Garment (DTG) printing is the perfect way to create a photographic, full-colour, retail quality T-shirt print without needing to pay expensive screen print setup fees. Due to its soft-feel and slightly less vibrant colour reproduction, DTG printing is a popular choice for retro and vintage style designs. Full-colour and photographic images can be printed. Colours in final prints are greatly affected by colour of backing fabric & will fade with time. 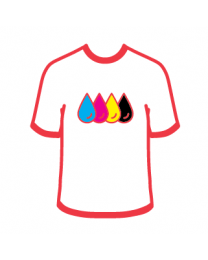 Ink is applied directly to the T-shirt, eliminating any "plastic" feel. DTG offers the softest feel of all our print methods. DTG prints are sensitive to fabric composition and will not reproduce as vibrantly as digital tranfers. Low setup costs and no minimum orders (1+ units available). This print method is not as cost-effective for larger orders as the print process is far slower than screen printing, and the machinery & inks more expensive. Prints up to 28cm x 38cm can be achieved. The durability of DTG prints are lower than that of transfers; making them ideal for prints requiring a worn or "vintage" look/feel, but making them generally unsuitable for heavy duty wear. Repeat orders do not incur setup fees. Once your artwork has been set up, we'll keep it on file indefinitely. DTG is best printed on cotton based fabrics, 100% polyester is not suitable for DTG. View Mabuzi’s garments and pricing in our online catalogue. Can’t find what you need? Request a quote or contact us. © Mabuzi All rights reserved.